Fascinated by machines and also by the possibility of understanding the human soul, Paméla Landry builds sculptures that, although they suggest the portrait mode, do not borrow its form. Her masculine-looking assemblages of heterogeneous objects lend their appearance to feminine voices, working towards a disturbing and unstable identity. The three interactive sculptures composing "Le Centre de la caress"e evoke different states of involvement, discovered and explored as one touches, embraces or simply listens. The ensemble is comprised of Le Poste des contentements, Le Rayon du besoin and L’Aile de l’abandon. Disheartened by the notion of a world where everything has its place and function, Paméla Landry proposes sculptures that divert and confound identities, and offers them as alternative solutions. In her sculptures, the seeming coherence of a whole opens up to the derisive and the absurd when manipulation and interaction occur. Pamela Landry has participated in numerous group and solo exhibitions across Québec and Canada. Her most recent shows include "Le Ludique" at the Musée du Québec, "Machining in the Digital Age: Bricoleur Urbane" at Open Space in 2001, "Les Iconoclastes", curated by Gaston Saint-Pierre at the Chapelle historique du Bon-Pasteur in 1997, and "Tes yeux" at B-312 in 1997 and the Richmond Art Gallery in 1999. She also curated "Machines festives", presented at La Centrale in 1999 and showing again at L’Œil de Poisson in 2002. Paméla Landry lives and works in Montréal. She has taught at the Cégep du Vieux Montréal since 1995. - Delgado, Jérôme, «Se frotter à l’art», La Presse, 21 janvier 2002, p.C4. - Lamarche, Bernard, «À marquer de pierres blanches», Le Devoir, 19-20 janvier 2002, p.C10. - Mavrikakis, Nicolas, «Rentrée culturelle d’hiver», Voir, 10-16 janvier 2002, p.18. - «Fast Forward», Canadian Art, vol. 18, no 4, hiver 2001, p.20. - Mavrikakis, Nicolas, «Touche-moi», Voir, 4 au 10 avril 2002, p.46. Project developed in collaboration with Josée Blanchet, Dmytro Chraiman, Bernadette Houde, Jean-Ernest Joos, Maria Pasik, Gwenaël Rattke, Svetlana Sinitsina, Steve Topping and Lynne Trépanier. We are invited to move through a conduit composed of three mediums – photography, sound, film – that successively confront us to an image of the body, to voice, and finally gesture. However none of these experiential moments is self-sufficient, nor do they even complement one another. Faces stand out against a neutral background and refer to no identifiable event; rich and seductive voices, yet out of body and context, speak almost about nothing save language; moving gestures overflow with meanings, silently bespeaking an encounter whose significance has been lost. Everything here is being played out in blanks and interstices. Pursuing his reflection on formlessness, Carl Trahan ponders over the phenomenon of interlanguage, the singular formations – or deformations – that arise from precarious attempts at passing from a mastered language to one in learning. The sounds produced are located somewhere between failure and creation, the incredible and the understandable. In order to attempt the impossible and grasp these momentary works that are closely related to a singular voice and a unique encounter, the various dimensions of the speech experience are thus dissociated. In the interstices produced, one will be able to experience the disarray, the bedazzlement, the discovery and the wandering felt by those who find – and lose – themselves between languages. Project developed in collaboration with Josée Blanchet, Dmytro Chraiman, Bernadette Houde, Jean-Ernest Joos, Maria Pasik, Gwenaël Rattke, Svetlana Sinitsina, Steve Topping and Lynne Trépanier. Participants are interdisciplinary artists (photography, painting, sound, film, video, installation...), fashion designers, linguists, philosophers. They have lived in the Ukraine, Russia, Israel, France, Germany and the USA. They speak French, English, Russian, Ukrainian, Hebrew, German, Spanish and Arabic. They all live in Montréal. Carl Trahan’s work has been presented among others in Montréal (Skol, Clark), Rouyn-Noranda (L’Écart), Toronto (Mercer Union, A Space) and Kelowna (Alternator). This project is dedicated to Nathalie Richer (1967-2001). Carl Trahan wishes to thank the participants for their support and generosity, as well as Bertrand L'Abbé and Karina Mariano. -Lamarche, Bernard, «À marquer de pierres blanches», Le Devoir, 19-20 janvier 2002, p.C10. -«Fast Forward», Canadian Art, vol. 18, no 4, hiver 2001, p.20. "Peripheral Narratives" comprises two elements, My baby just cares for me, a video installation and I’ll be seeing you, a series of five photographs. In the video installation My baby just cares for me, the narrator retells an experience of witnessing an immigrant couple’s ambiguous struggle, which occurred during a short stop at the Brussels North Station. His interpretation of the incident is that of an outsider, whose temporal constraints and individualism create inner conflict. On one level, the work is about public spectatorship and how in turn the presence and actions of the "other" are read as "the spectacle." I’ll be seeing you references the documentary genre of police photography to explore notions of identity and memory re-construction. It suggests that memory is essentially a form of imagination, melding the physical perception of the real, with the elusive portrayals of remembered faces and intense experiences. Since the photographs do not disclose the facts behind the faces, the work offers the viewer an opportunity to investigate and to essentially construct, just as the portraits are literally collaged, a narrative from the given fragments. As memory operates in both subjective and objective languages, it constantly mixes personal desire, imagination and guilt with learned perceptions based on collective social or cultural memory/amnesia. These exhibited works attempt to examine memory as the social, psychological and emotional location of the self. Although the two works are independent, shown together, narrative strands are formed inevitably between them. Marcelino Stuhmer is an American born artist of Dutch/ Indonesian heritage. In 2000, he received his MFA from the School of the Art Institute of Chicago and was also a participant at the Skowhegan School of Painting and Sculpture. In 2001, he received the Royal Prize for Painting in the Netherlands and has participated in several group exhibitions in the USA and Holland, including Zolla/Lieberman Gallery in Chicago and the Gemeentemuseum in The Hague. Upcoming projects in 2002 include a solo exhibition at the Essl Collection in Vienna as part of their Emerging Artist Series and the publication of his artist book, I’ll be seeing you. He is currently an artist-in-residence at the Rijksakademie in Amsterdam. - Crevier, Lyne, «Glandeur», Ici, 7-13 mars 2002, p.31. Upon the end of five-year art collaboration, Thérèse Mastroiacovo began a body of work entitled The Politics of Recognition that would complicate ideas of shared authorship, collaboration and communication. Applying images of entanglement and using devices like shutter release cables, the work sought to force the limitations of self-expression, ownership, authenticity and ethical practices. It is with this history of work behind her that she began Hello fellow artists, a video series that appropriates, or somehow re-orients, the work of other video artists in a way that acknowledges the source but re-arranges the outcome. Inevitably infringing upon copyright, she experiments with herself as a known entity only to fall short of being recognized as the artist of this work: the original always more identifiable than her own. Forced to collaborate with Mastroiacovo in this first version of her ongoing project include: William Wegman, Dara Birnbaum, Antonio Muntadas, and Douglas Gordon. Thérèse Mastroiacovo is a visual artist who works in film, video, photography, sculpture and performance. She lives and works in Montréal. -Tousignant, Isa, «Video killed the video star», Hour, 14-20 mars 2002, p.29. Temps fantômal is the first exhibition to be presented within the context of La survivance: a series of exhibitions and events programmed by Optica for the year 2002. In this collective exhibition, works by Dianna Frid (Chicago), Rosa Lee (London), and Laurent Roberge (Montréal), disclose the slow, contemplative engagement of artmaking. These artists address time in a way that is experiential, revealing the somatic side of the creative process. Each of these artists produce work through repetitive actions and a slow accretion of material. Rosa Lee layers paint to create intricate, almost ''woven'' abstractions; Dianna Frid embroiders diagrammatic images onto fabric that has been cut, sewn and frayed; and Laurent Roberge piles small squares of paper to construct sculptural forms that echo and disrupt the gallery space. For me, the repetitive, often obsessive actions involved in making these works emphasizes the labour involved in recurrent daily activities. The regular gestures required to complete each work allude to tasks that are cyclical, never truly finished. While the individual art practices of Lee, Frid, and Roberge require a commitment to craft, a reading of their works is not subordinate to its display. Works by each artist are presented in the gallery, while reference materials, tools, and other objects relative to their formulation are presented in the multidisciplinary room. This space will conjure the laboratory /studio, where the circuitous path to individual creation offers its own enigmas and revelations. As technology plays a larger role in our daily activities, concepts of speed and efficiency take on new significance. Temps fantômal takes a position in direct contrast to these goals, featuring works by artists whose process is slow, repetitive, and contemplative. Lorraine Simms lives and works in Montreal, Quebec. She completed her MFA at Concordia University (1990) and currently teaches in the Fine Art Department at Dawson College. She has been the recipient of numerous grants from the Canada Council and the Conseil des Arts et des lettres du Québec. Her work has been presented in many group and solo exhibitions including: "Conte de jours /Recounting Days", Optica, un centre d’art contemporain, Montreal (1998), and "Shadow" at A.R.C. Gallery, Chicago, Illinois (2000). This year she has had two solo exhibitions: "La foule" at Galerie Occurrence, Montreal; and "Moments figés" at Galerie Expression, Ste-Hyacinthe. She has previously curated three exhibitions, "Matière Papier", Galerie McClure, Centre des arts visuels, Montréal (1991), "Le Jardin manifeste" (1993) and "Conceits" (1995) for Galerie La Centrale, Montréal and co-curated "Moments entrelacés", Galerie La Centrale (1998). Her text Signs of the Times: Reading and writing painting was published in conjunction with this curatorial project. Rosa Lee lives and works in London, England. She studied at St. Martin's School of Art and the Royal College of Art and has received a number of awards, including two British Council Awards (1994, 2002) and John Moores 16, Liverpool (Prizewinner 1989). She was Visiting Fellow in Painting at Winchester School of Art from 1988 - 89, has lectured extensively and has published several papers in art journals. She is currently writing a text for a book edited by Rosemary Betterton. Lee's paintings have been presented in numerous solo and group exhibitions, including "British Abstract Art Part I" (1994) and "Part 3" (1996). She has also taken part in the following touring group exhibitions: "(dis)parities" (1992); "Surface" (1993); "The Question of Scale" (1995/96); "Permission to Speak" (1996); "Craft" (1997-98); and "Fabrications" (1999). Dianna Frid was born in Mexico City and immigrated to Vancouver, Canada, in 1983. She currently lives and works in Chicago. She has a BA from Hampshire College, MA (1988), a BFA from the School of the Art Institute of Chicago (1991), and is currently in the MFA program at the School of the Art Institute of Chicago. She has received numerous awards and grants, including those from: Canada Council, The School of The Art Institute of Chicago, and The Banff Centre for the Arts. Her work has been presented in many group exhibitions. Recent solo shows of her work include: "Les Jeux Sont Faits", Esso Gallery, New York (2001), "Du Sable Park: Hidden In Plain View", Chicago Architecture Foundation (2002), and "There Was, There Is", St. Mary’s College, Notre Dame, Indiana (2002). Laurent Roberge lives and works in Montreal. He studied at the Emily Carr College of Art and Design (Visual Arts Diploma, 1982), Concordia University (MFA, 1989) and McGill University (Diploma: Education in the Arts, 1992). He is currently teaching in the Fine Art Departments of Concordia University and Dawson College. He has received numerous awards, including several from the Canada Council and the Conseil des Arts et des lettres du Québec. His work has been presented in solo and group exhibitions including "Touch, Please", Kyoto, Japan (1995), "The Paper Biennale '98", Rijswijk Museum, Holland (1998), "Les Bricolos", Galerie Clark, Montreal (1998). A solo exhibition of his work was presented at Galerie Clark in 2000. -Lammerich, Yvonne, «News, Montréal», Contemporary, juin-juillet-août 2002, pp.43-44. -Lehmann, Henry, «City Focus : Montreal», ARTnews, mai 2002, pp.100-104. 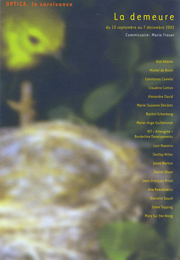 -Patterson, Jody «Temps fantômal», para-para, no 008, mai-juin-juillet 2002, p.3. © Programme l Program, 2002. Maintaining a connection between artistic experience and everyday, even domestic life, this exhibition brings together artists who interrogate the notion of the dwelling,opening it up to a reflection on mobility, nomadism, housing shortages, and on the encounter between private and city life. Today, from our living space, and in the midst of cultural motion, the dwelling is fashioned by its own quest and by the idea of inhabiting the unusual. Original works presented in public and private spaces throughout the city of Montreal, from September 13th to November 3rd, 2002. Exhibition of artists' documents and archives - September 13th to December 7th, 2002. An intervention in private spaces. People could request the service until September 18 by calling Optica for an appointment: the files and archives of Cultural Services Inc. could be consulted at the gallery. Daniel Olson is a multidisciplinary artist interested in basic household objects that he playfully and audibly transforms, either for presentation in exhibitions or for use in performances. The question of the domestic universe — of how the body interacts with everyday objects and the immediate environment — and the private and public dimension of people's lives are likely the most important aspects of his artistic practice in recent years. Discretely and on request, like a detective under the aegis of a cultural services company, Olson will infiltrate private life and lead an investigation into people's habits and cultural commodities, consulting their books, magazines, art, and CD and record collections. In turn, like a shadow, he leaves hidden traces of his passage. The results of his private investigations are compiled and available for viewing at the gallery. Rachel Echenberg works on the threshold of the private and the public. Attempting to provoke highly intimate experiences in often anonymous spaces, her performances attest to the body's extreme vulnerability in public space. In recent years, her work has lead toward an approach in which her public presence, sometimes eliciting interactions with passersby, outweighs the object. Echenberg describes her performance body-house: les paroles autonomes as an attempt to dwell within herself while remaining simultaneously present in the exterior setting. Her body appears as a metaphor for the dwelling, on the border line between the individual and the social. Echenberg will sit for several consecutive hours, transmitting sounds produced by her body in the surrounding space. These sounds, broadcast over loudspeakers, mix with the noises and presence of others. The idea of the “body-house” is here that of a “transmitter-body,” projecting its interiority in the space of the other. The lot between St-Laurent boulevard and Clark street, on de Maisonneuve boulevard. The lot at the exit of St-Laurent metro station. Shelley Miller creates an interstice between the domestic universe and industrialized city space. Fragments of ornamental motifs, sketched with cake icing, partially cover the graffiti on the brick walls of residential and commercial buildings in various spaces throughout the city. At once trimming and wall-covering, Trimmings recalls interior decorative spaces and the opulent life style associated with them. Turned inside-out like a glove, however, this interior becomes exterior, and private space breaks out into social space. The colourful motifs, made of sugar and meringue, seem suspended between an aura of ornamental sumptuousness — the kitsch world of excess associated with popular culture — and the social gestures that graffiti represent. Beyond the interwoven critical references, by using a perishable, self-disintegrating material, Miller also underscores the expunction and disappearance of signs of private life in public space. A wandering trailer appears on the street, in a perimeter delineated by boulevard de Maisonneuve and Ste-Catherine street, including St-Laurent, Clark, and St-Dominique. Midway between sculpture and an architectural pavilion, Alexandre David's installation occupies a place of passage, with which it integrates perfectly, fully taking advantage of its transitory potential. Minimal in appearance, the wooden construction entices one to stroll about and affords passersby the experience of place in several manifestations: veranda, house, living-room, and garden. Neither inside nor out, neither private nor public, it presents itself as a series of interstices and gradations that subvert the very idea of place. As in a passageway or an ambulatory, the space that surrounds us makes us aware of the constantly postponed presence of another. This spatial complexity is reinforced, from within as from without, by the presence of trees that at once enclose and open the structure. And it's rather the notions of place and of threshold that help describe our experience, as if each space actually presented itself as a connection, thus obliterating its own limits. Lani Maestro connects the dwelling with displacement. Many of her works have sought to show how the quest for home and the notion of exile are the very conditions of existence. If only by its title, The Room in Space evokes the idea of an empty place and of isolation, but it also presents itself as incentive to create our living space ourselves. Consisting of a set of sculptural installations placed in three city parks and leading us through the city, the work invites us to different experiences of place. These structures of wood and bamboo dwell in space like small oases that one may find almost by chance, following one's course through the parks, trees, branches, and people. Intimate in scale and placement, the compartments await habitation, as it were, the investment of our presence. Facing the act of appropriating this space, we are involved in a poetic experience that invites us to view the dwelling not only as the place in which we live, but as a way of being and living in the world. Wednesday through Sunday, noon to 5 p.m.
Over the last few years, Rewakowicz has produced a set of inflatable works, including a room and some clothes that one can handle, carry and move, but that, in a playful spirit, place people in strange situations of comfort and discomfort. The disorienting experience of mobility and instability helps re-examine the dwelling's definition as a set place of belonging where identities are forged. The Occupants pursues this interrogation by inviting people to interact with sounding-balloons residing in various apartment spaces. Flexible and formless, the balloons can take possession of the room, occupying it completely, blocking a door or window, or simply floating within the space. This intrusion metaphorically evokes the presences of a foreign body in one's own living space. Rewakowicz deliberately places us in a situation of negotiating with this intrusion such as to bring our attention to the distance that separates us from others, from those who surround us and whom we meet every day. For several years now, Danielle Sauvé has presented objects taken from our household environment, objects that seem at once familiar, intimate, yet also strange, as if dispossessed of their properties. Through exaggerations of scale and by interchanging the qualities of objects and a variety of everyday instruments, she distorts them and steers them into the fabricated, constructed, and yet so poetic universe of sculpture. Chambres paupières is a video installation that explores the same feeling of familiarity and strangeness. The dwelling appears as a quest, here, as a place to reach, yet one that constantly eludes us. Scenes of urban wandering and intimist scenes drawing on the domestic universe crisscross and follow one another in image sequences projected on small screens. The images accompany the furniture and various household objects in the space of an apartment. Sauvé began working on her first filmed images during a residency in Barcelona two years ago. Temporary residence on the roof of the Multidick company's building, at 4495 Côte-de-Liesse Road, visible from the Metropolitan highway. Each having developed a critical reflection on the presence of the body and on its relation to urban space, Marie-Suzanne Désilets and Jean-François Prost are collaborating on a first temporary shelter project. Installed on the roof of a building near a highway, their dwelling strangely occupies an extreme, densely concentrated urban environment marked by anonymity and movement. Their immobile trailer is immediately visible to drivers on the raised, high-speed highway. Lit up at night, its presence is all the more evident in erupting from the urban landscape and road-traffic atmosphere, appearing like a fictional construct of the imagination. For two weeks, the artists live in their refuge, sharing their existence and quotidian life in this weird location, isolated from any private space or domestic environment. Investing an impossible site, they underline the precariousness and vulnerability of housing, while also helping to shift the function of architecture toward process, placing more emphasis on living the everyday, on survival, and on solitude. Kim Adams' work often alludes to the dwelling. Notions of habitation and mobility are playfully dealt with through extreme, derisory and far-fetched environments evocative of as many human constructions and inventions. Since the end of the 1970s, Adams has built up a very peculiar “collection” of images, a kind of personal archive that she refers to in her work — some two hundred slides, many of which display strange temporary dwellings, mobile homes, vehicles, and all kinds of altered, doctored and reinvented means of transportation. These images attest to the way people invent themselves and conceive unusual ways of inhabiting the world and of moving within it, ways that appear eccentric, yet strangely charged. They translate life styles and speak to us of mentalities. The exhibition also presented some of Adams' maquettes. A thirty-minute performance presented in 1995 as part of the Bienal de Vencia, held in Bogota, Columbia. Taking place at the same time as the Venice Biennial in Italy, this event is organized by the Columbian artists' collective Las Matracas, in Venecia, a poor neighbourhood in the city. Performers: Constanza Camelo, Santiago Echeverry, Sara Yepes. Performance presented as part of "Émergence 2001: La famille", in Quebec City, August 19 - 25, 2001. For the last few years, Claudine Cotton's performances have been increasingly based on a presence with others and on human interaction. They provoke situations of encounter and congeniality, in an exchange at once with the strange and the familiar, with the public and the private, and in which people are invited to participate and engage. Une vraie famille doit faire son lit petit à petit pushes that quest still further by seeking to establish an intimate rapport with people in the street. As in a form of vagrancy, Cotton moved around every day in the St-Roch district of the city of Quebec, inviting people to sleep in her “strolling-bed.” Literally intruding in city space and in a public place, the image of the bed becomes the basis for encounters with people and evokes a familiar universe, even domestic comfort. This welcoming of the stranger in one's own space — where shared intimacy becomes the basis for encounters — bears some connection with the dwelling as a quest for a home. Mobile, portable and intimate, the works of Marie-Ange Guilleminot are conceived in a relationship with the other and function as a gift. The virtual project transformationparlor.com is built in the same spirit of interface. This Web site brings together artists, their works, and personal accounts to form an exhibition space that appears in a constant rapport with living space. Part of the site is articulated around the house plan of Brazilian artist Lygia Clark, Construis toi-même l'espace où tu vis (1960). By clicking on the room-modules, the plan opens on new spaces where one discovers works connected with the body, with clothes, with places we live in and that live within us. For its presentation at Optica, the site has developed to include a project produced in October 1994, in Tel Aviv. Marie-Ange Guilleminot had then occupied the terrace of the Bograshov gallery for a month, transforming the exhibition space and gallery office into a living space in rapport with the street. That momen was for Guilleminot the beginning of Salon de transformation, a work that has been travelling the world since 1997. Greylands is the title of a project and the name of an artist, architect and engineer's collective, active in several cities in Europe and the US, that develops in situ and Web interventions with a critical and socio-political perspective. Under the cover of a real estate company, with its fake sales office, Greylands proposes a satirical commentary on the use and planning of urban space. After KIT's first intervention in Widnes, England (1997), the collective produced other projects for the redevelopment of “grey zones” in residential spaces on a contaminated lot in downtown Ottawa (1999) and on a public square in Mexico (2002). From a home PC, via , one could purchase land on residential development allotments and draw out the virtual plans for one's residence. The company set up its offices on the real site and operated as a housing development business. The projects are archived and documented on the company Web site. Installation presented in Toronto, at 13 Third St. Wards Island, November 7 to 21, 1999, and at Trinity Square Park, in April 2000, as part of the wool works exhibition organized by the Textile Museum of Canada. To cover a house at Wards Island, Janet Morton produced a kind of clothing made of some 800 pieces of used knitwear, buttoned and decorated with hand-knit architectural details. First clothing an inhabited home, the project was then reinstalled for three days on a scaffolding structure at Trinity Square Park. Normally used to cover the body, clothing here takes outlandish proportions, reaching habitable dimensions (7.62m x 8.53m). Although Morton seems to refer literally to the dwelling as a symbol for warmth and refuge, the covering, acting as protection, reveals its fragility and vulnerability. The inside is turned toward the outside, provoking a reversal of private and public spaces, and still more emphatically, of intimacy and exteriority. Accentuated here by the scale of the object and of the material (knit clothes), the contradiction between public experience and private space seems to domesticate the notion of the public. Installation-performance produced and presented during the Lobe residency-projects in Chicoutimi, on the Saguenay, close to the village of Ste-Rose-du-Nord, February 19 to March 10, 2000. As an artist and architect, Jean-François Prost has a hybrid practice that combines installation and performance. The projects he has produced in recent years eschew the traditional framework of architecture, seeking rather to invest residual areas, kinds of no-man's-lands or vacant lots. Working on a household scale, his attention is drawn to the idea and to the day-to-day dimension of a living space closely related to the environment. His reflections include such themes as urban life, nomadism, and de-territorialization, together with thoughts on shelter and human relationships. Convivialités électives took shape following an invitation from the Lobe in Chicoutimi. Prost set up a temporary shelter on the iced-over Saguenay and lived there several weeks during the winter. Near the fishing sheds, the abode becomes a shelter and refuge. The dwelling is here inspired by a dialogue with the setting, the people, and the environment, and is informed by the vulnerability and precariousness of survival and by the observation of everyday life. In recent years, Steve Topping produced temporary housing projects in different places throughout Quebec and Canada, including Cartier, Ontario (winter 1997), and downtown Montreal (1998-99). By developing his shelters and alternative spaces as ephemeral and portable dwellings, he reexamines the status of the household environment. In particular, he questions how the development and organization of residential space can affect and transform our everyday live. In Montreal, he lived for six months in a household space that he set up on the roof of a commercial building on the corner of St-Laurent and de Maisonneuve, in a space that once housed old freight elevator machinery. His living space was entirely thought out in terms of very limited, even restrictive housing space, and of objects he could recycle. What redefines the dwelling here is not the housing itself, but a process oriented toward the daily experience of a living space that remains entirely adjustable, changeable, and adaptable to recycling and a nomadic life style. Saturday, September 28, 1 p.m to 5:00 p.m.
Saturday, October 5, at the gallery, 2 p.m.
Saturday, November 23rd, at the gallery, 2 p.m.
- «Artist Run Culture - A portfolio of recent and upcoming work from across the country», Mix V 28.3, hiver 2003, p.16. - Charron, Marie- Ève, «Espaces à occuper», Le Devoir, 28-29 septembre 2002, p.F10. - Delgado, Jérôme, «Mexico, Mexico, Mexi-iii-co!» La Presse, 7 septembre, 2002, p.15. - Delgado, Jérôme, «Visites libres», La Presse, 22 Septembre 2002, p.E6. - Devine, Shannon, «No Birthday Cakes Here, Local Artist elevates baking materials to high art», the LINK, 29 octobre 2002. - «Fast Forward», Canadian Art Fall 2002, vol. 19, no 3, p.34. - Giguère, Amélie, «La demeure Inventer la demeure», ETC Montréal, vol 61, mars-avril-mai 2003, pp.27-31. - Lamarche, Bernard, «En tous lieux», Le Devoir, 24-25 août 2002, pp.C10-C11. 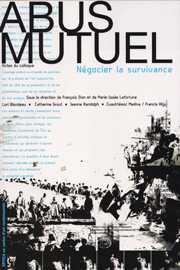 - Lamarche, Bernard, «Art contemporain et logique événementielle», Coranto #1, novembre 2002. - Miller, Marcus, «News, Montréal», Contemporary, décembre 2002, pp.23-24. - Miller, Marcus, «Highlights, Montréal», Contemporary, décembre 2002, p.30. - Monfort, Mikaëlle, «Rue des plaisirs», Quartier Libre, 10 septembre 2002. - Paré, André Louis, «La Demeure», para para, no 10, avril-mai-juin 2003, pp.2-3. - Redfern, Christine, «2002/ the year in review / Visual Arts Off the wall», Mirror, vol. 18, no 29, 24 décembre 2002 - 8 janvier 2003. - Rochefort, Jean-Claude, «Improvisation no 2 : Un bilan plutôt dont on attendait beaucoup plus», Le Devoir, 2-3 novembre 2002, pp.E11-E12. - Woodley, Matthew, «Space invader», Mirror, 19-25 septembre 2002, p.41. -«Tranches radicale dans l’année d’art 2002 au Québec», INTER, no 84, pp.4-33. - Couillard, Claude, «Arts Visuels : Artiste Détective», 5 octobre 2002, [www.radio-canada.ca/culture]. - Couillard, Claude, «La Demeure», 19 septembre 2002, [www.radio-canada.ca/url.asp?/culture/expositions/v2/]. - Entrevue à Radio Canada CBC , Émission «Montréal Ce Soir» de Raymond St. Pierre, 1 novembre 2002. - Entrevue à Radio Canada CBC, Émission «Tous Les Matins» de Dominique Bertrand et Paul Houde, 8 novembre 2002. Death is ten seconds away. Just enough time to do something simple and unimportant. In the context of extreme sports, the artist and his skydiving mentor invite spectators to consider the meaning of keeping control in dangerous situations. Falling through the sky is a difficult place to do something ordinary. The fear of dying, of making mistakes, of not getting it right, or of simply looking stupid all come into play and have to be overcome in order to continue, to survive. Turning Point is a collaborative project between artist Paul Litherland and aerial performer Bertrand Cloutier. It is a video installation consisting of two synchronized video projections with quadraphonic sound. Viewers are mesmerized and destabilized by two skydivers in freefall (Litherland and Cloutier), signalling to each other and the viewer. Together they turn circles in perpetuity. - «Legend of the fall», Mirror, 12-18 septembre 2002, p.56. When I was 10 I was given a miniature Holy Bible for my First Holy Communion. It had a little brass cover with a tiny loop I assume was for attaching to a key chain or necklace. More an amulet than a book, it was nearly impossible to properly open, and the text far too small to read without a magnifying glass. It was not really a book, but merely the idea of a particular book, a portable cue to remind me of the importance of the compacted information it contained. The work that I am showing at Optica appears as two collections of books. However, assembled out of digital prints, coloured construction paper and scotch tape, these books exist as merely surface. Physically empty of information, they behave unlike the many books we have come to known. Instead, they are filled with the mere idea of what a book is meant to be. This symposium brought together artists, critics and curators whose critical and artistic activity contribute to a re-evaluation of our relationship to historical models and to traditional dissemination networks in a context marked by globalised markets and a propensity for cultural nationalism. There is in their practice a will to respond to and rethink habits, automatisms and conditionings that shape and determine the existence of art, from the point of view of production and presentation, as well as reception and analysis. In the context of the symposium, participants and guest speakers will have the opportunity to examine and comment on what they feel is significant and emblematic of current attitudes that result from the mixture of individual motivation and institutional pressure. The way these individual positions themselves produces critical activity, generates other networks and events on the margins of the international artworld, and leads to alternatives. Within a dialogue that seeks to share what takes form mainly through work and action, the meeting wishes to foreground the individual as an agent capable of playing a part in the artistic sphere, in Bourdieu’s sense. Action is thus linked to the notion of presence and persistency, even counter-power, in a spirit of constant negotiation between various agents. Lori Blondeau is a Cree/Saulteaux artist living in Saskatoon. Her work includes performance, sculpture and new media production, and explores the influence of (contemporary and historical) mass media and culture on aboriginal identity, images and self-definition. She has been interested in the effect of colonisation on the traditional and contemporary roles of First Nations and the lifestyle of their members. In September and October 2001, she participated in "Blast" (Gallery 101, Ottawa) and "Locating Feminism" (MAWA, Winnipeg). Lori Blondeau is also a founding member and director of the artist-run centre Tribe in Saskatoon. Emmanuel Galland is an artist, communicator and independent curator, well known in the Montréal local scene for his involvement with the artist-run centre Clark where he organised successful events that have brought the community together such as Les bricolos. He has been actively involved in a wide variety of networks, among them "AfricAmérica"’s forums (2000-2002) where he was part of the programming team over two years. His interest in exploring and revisiting Euro-centrism and Americanism has taken him to the Havana ,West Indies and the Dakar Biennales as an observer. Catherine Grout holds a Ph.D. in art history and aesthetics, and is the curator of the Biennale d’Enghien-les-Bains since 1993. She is now a guest associate professor at Keio University (Tokyo). Her research and work have dealt with art in the city and the landscape since the 1980s. Recently, she has organised manifestations such as "Le paysage du fleuve Tamshuei, la ville rencontre le fleuve", 1er festival de Chuwei, in Taiwan and "Artists in akiya", in Tokyo, Kyojima, Japan (2002). She is the author of several books: À propos de l’art dans la ville (Besançon: Éd. Unité Mobile, 1991), Le Tramway de Strasbourg (Paris: Éd. du Regard, 1995), L’Art en milieu urbain (Tokyo: Éd. Kajima, Erimi Fujiwara trans., 1997), Pour une réalité publique de l’art (Montréal/Paris: Éd. L’Harmattan, 2000), Pour l’art dans notre quotidien. Des œuvres en milieu urbain (Taipei: Éd. Yuan-Liou, Yao Meng-Yin trans., 2002). Founding member of the “Groupe de Recherche franco-japonais sur le Paysage Urbain” (Tokyo University, Toyota Foundation), she designed an international symposium on emerging notions in the field of landscape at TN Probe, Tokyo, in 1997. Cuauhtémoc Medina is an art critic. He has written extensively on contemporary art in Mexico and Latin America. He was curator of contemporary art at the Carillo Gil Museum, member of the staff of "Curare: Critical Space for the Arts" and is currently researcher at the Institute of Aesthetic Research, National University of Mexico City. He recently published Recent Political Forms: Radical Pursuits in Mexico,TRANS>arts.cultures.media, No. 8 (2000) and Graciela Iturbide (Phaidon Press). He was invited by Parachute as guest editor for its special issue on Mexico. He recently curated an exhibition for the South London Gallery at the Tate in London, England. Jeanne Randolph is a psychoanalytically-biased cultural theorist who has been driven quite mad by The Technological Ethos, anti-intellectualism, the public erasure of ethical imaginations and the imperialism of advertising. She is an assistant professor at the University of Toronto Department of Psychiatry from which she has strayed willfully over the past twenty years seeking time to read, to think, to write and to perpetrate her “performative lectures” throughout Canada. Her third volume of collected writings, LIVES OF OBJECTS BRIEF AND ENDLESS: psychoanalytic images of a technological society, will be published by YYZ Books in December 2002. The symposium was held at the SAT with a live audience over a 4-hour period. Each speaker made a 15- to 20-minute presentation to which other participants and the audience was able to respond. Presentations and discussions alternated with live or recorded video works and/or performances transmitted via the Internet. The audience linked via the Internet was able to communicate with the speakers throughout the event by using a chat window. The moderator was forward their questions to the speakers during question periods. FRANÇOIS DION graduated in arts from the l’Université du Québec à Montréal and is the co-founder of Cube Éditeur. He has contributed texts to a variety of periodicals and catalogues in Quebec and Canada, and has collaborated in the organization of diverse cultural events and symposiums. As a curator, he has organized exhibitions for VOX Gallery, Optica, and the Saidye Bronfman Centre in Montreal, as well as for Galerie 101 in Ottawa , and Le Centre d’art contemporain de Rueil-Malmaison in France. He is currently preparing a show for the Art Gallery of Ottawa. From 1996 to 1998 he was the co-ordinator of the Regroupement des Centres d’Artistes Autogérés du Québec, prior to directing Gallery 101 in Ottawa. He was also a board member of the Artist -Run Centres and Collectives of Ontario. Since 2001, he has been the director of Artexte Information Centre in Montreal. MARIE-JOSÉE LAFORTUNE is the artistic director of OPTICA, a centre for contemporary art where since 1993, she has focused on the dissemination and promotion of crictical and editorial activities of the gallery. She is an artist and curator, and has published texts in Parachute, Spirale, Esse and Mix Magazine. Recently in collaboration with Lynn Hughes, she co-directed Creative Confusion, Interdisciplinary Practices in Contemporary Art, a new collection of critical essays published by Optica. Ingrid Bachman is an interdisciplinary installation artist and an occasional writer and curator, whose interests span obsolete technologies and new digital media. Currently she is researching emergent behaviours in embodied systems and networks from the field of Artificial Life as models to create generative and interactive artworks. She is the co-editor of Material Matters, a critical anthology of essays that examines the relations of material to culture. Presently, she is the Graduate Programme Director, MFA Studio Arts at Concordia University. Artengine is an artist-run, not-for-profit, federally incorporated organization and internet site for visual and new media artists devoted to the propagation of art on the internet as well as to the artistic exploration of new technologies. The goal of Artengine is to increase artists' presence on the World Wide Web and to initiate and participate in the artistic applications of digital media. - Mavrikakis, Nicolas, «Arts Visuels, Nos Choix», Voir, 5-11 septembre 2002, pp.83-84.